New Year poems help us reflect on the past year, and look forward to the new year. Looking back, we ask God forgiveness for our past sins, and thank God for the blessings He has given us. Looking forward, we pray, asking God with hope for His blessings on the coming New Year. The day before New Years is a great time to spend in reflection, on the shortness of time, how we all must die and be prepared to face God. These 2 poems are about sorrow for sin, and thanking God for the many gifts and blessings we have received over the past year. The first is a poem to thank God. The second is a poem prayer asking God for his blessings. Over a dozen short poems, many of these are about time. The old year is going out, the New Year is coming in. Meanwhile, time doesn't stop. Time flies! Over a dozen short poems to show us the value of time, and the importance of using it wisely. Was this last year especially difficult? We can find reasons to be thankful in everything. We are alive. We are able to read or hear this. 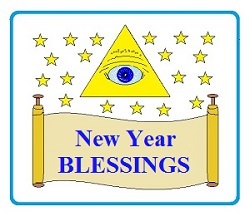 Wishing you and your loved ones a happy, healthy, prosperous, abundant, holy, and blessed New Year!